Raspberry Almond Chia Overnight Oats are a perfect grab-and-go for breakfast! Make this delicious recipe tonight and enjoy tomorrow morning! 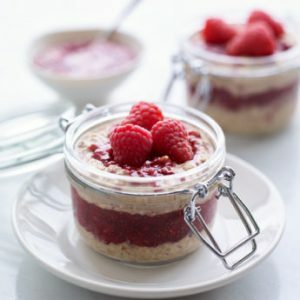 The oats and raspberries are a great way to replenish any lost carbs while the Greek yogurt, almond butter, and chia seeds add a great source of protein! Whisk together yogurt, milk, maple syrup, almond butter, and almond extract until combined. Add in oats, chia seeds, and a pinch of salt. Stir until combined. Spoon 1/4 yogurt mixture in jar. Spoon 1/4 mashed raspberries into jar. Repeat until the jar is full. Make sure to end with mashed raspberries on top, or feel free to add on some whole ones. Cover the jar with a lid and refrigerate overnight.